The NEW LOCK-JAW OLY 2 features an improved design to increase strength and holding power over 50% from the classic version. The larger lever and uni-body design ensures easy installation and removal of the collar during workouts, while the elastomer pads and the resin frame protects the bar and plates from damage. Lock-Jaw is the best barbell collar choice for the lifters who demand maximum performance and durability from their equipment. * For use with bumper plates, CrossFit, or Olympic-Style lifting we recommend Lock-Jaw PRO 2 for maximum performance. The lightest of the Lock-Jaw Olympic collar lineup, the HEX features a patented quick-locking latch and maximum gripping surface area. Proprietary dual compound construction and unique design makes HEX extremely durable but also very lightweight. Holds plates secure and protects bar finish. I've used many types of collars and none come close to Lockjaw. Now that there are plenty of knockoffs, I gave them a try and ended up returning it within a couple minutes of opening the package. They may LOOK the same as Lockjaws, but they aren't (took more force to open / close than the old metal spring collars). Most of your quick on/easy off barbell collars are worthless, and the realy heavy duty collars work well, but can be slow to get on and off. 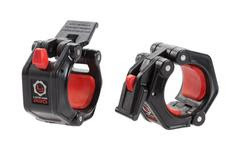 These Lock-Jaw collars are the best of all worlds: super fast and easy on/off. and very secure. Trusted at the highest levels of competition, all Lock Jaw Collars are built to absorb and sustain the force of repeated high-impact drops-- with solid construction delivering max durability over the long haul. These things are a great alternative to the main stream spring collars. The advantage is really shown when you have machine knurled Olympic bars, which means there are machined rings around the finished area where the plates mount. These types of bars are hard to slide the spring collars over, and it is usually a wiggle type of affair. These Lock Jaw collars open up and slide on no problem, and lock securely on the bar, holding the plates snugly (more so than the spring collars) to the inner stop collar on the bar. That being said, I like these Hex collars just as much as the higher end Lockjaw collars. The only differences to be aware of in terms of function are (1) they require very pressure force to lock in place, but are just as secure and (2) if you don't lightly hold them open when taking on/off they have enough natural tension that they stay fastened to the bar and don't slide on/off. After 2-3 uses you get used to it and it's really a non-issue. Overall, great collars and a better price than Lockjaw pro or elite. I believe these are the best collars on the market. The only knock on the rating is due to price since depending on the model a pair can run you $40-50, however the Hex Collars are a great alternative running at $25 a pair. I use these for ALL of my workouts which consist mostly of Crossfit WODs and Olympic Lifting. I have dropped 255lbs from overhead and they do not budge. I have done the workout Grace (30 clean and jerks for time) and weight might migrate a quarter of an inch but nothing very noticeable. Its nice knowing you don't have to waste time during a PR workout to adjust the weight because your collars aren't holding tight. Lock Jaw Collars are well worth the investment!